At the Mind Body Spirit Wellbeing Festival in Dublin you will find some of the world’s leading authors and presenters all experts in their field. Healing therapists, inspiring presenters and a vast array of alternative practices – a haven of discovery. Admission: Payable on the door: or online. 1-day pass €15. 2-day pass €25. 3-day pass €35. Children FREE. Please arrive at the lecture room 5-10 minutes prior to start time. Embark on an exciting journey together and enjoy the experience at the Mind Body Spirit Wellbeing Festival. The only way to discover your spiritual awareness is to seek out your own personal holistic guide. This is a three-day event featuring over 75 different workshops and lectures on alternative subjects such as aromatherapy, angel products, bio energy, body care, books,crystals, chakra tools, food, facial massage, healing, jewellery, juicing, music, massage, meditation, reflexology, tibetan bowls, therapies, and yoga. New this year is a Yoga Area Meditation/Mindfulness Area. Offering taster sessions hosted by some of the Irish best loved Yoga, Wellbeing and Mindfulness teachers. Wear suitable clothing. The largest Holistic & Wellbeing Festival in Ireland. 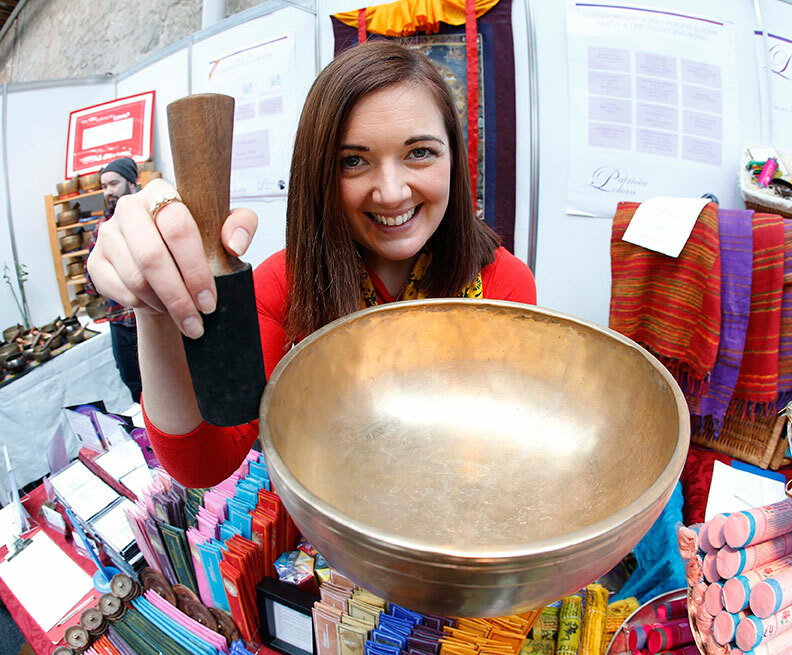 Featuring over 100 stalls providing the chance to sample new and established complementary and healing therapies, purchase an array of retail goodies or discover the future with a psychic, tarot, or angel reading. Our FREE live stage is the dynamic, energetic hub of the festival. A magical mix of musical concerts, dynamic displays of dance, shamanic drumming, mediumship, yoga sessions and much more. The live stage features over 40 performances, over the three day festival.